The first thing that caught my eye about sweet mini peppers was their bright color. Then their size. Then the snazzy bag with the cute built-in handle. 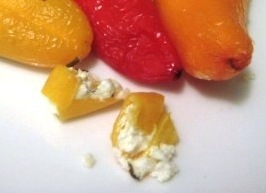 When I saw the recipe for peppers stuffed with goat cheese, I was sold. I picked up some fresh rosemary, basil, and chives and a 10.5-oz. Woolwich Chevrai goat cheese log in the “Original” flavor (read: plain). This fresh Canadian goat is OU-D kosher and cholov stam, not kosher for Passover. Soft and creamy, it becomes spreadable even before coming to room temperature. It has an outstanding milky flavor with a pleasant goat tang. I had planned just to make about half the recipe, using only 9 oz. of cheese, but I changed my mind and threw in a second goat log, a 4-oz. 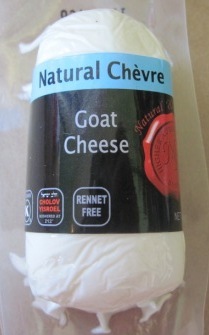 log of “Natural” chèvre (read: plain) by Natural & Kosher. This goat is a mid-western domestic type, OK kosher, cholov yisroel, and kosher for Passover. In contrast to the Chevrai, Natural & Kosher’s goat cheese is flakier, and its milk has a depth of flavor that hints at fresh flowers and grasses, allowing it to add its own herbaceous notes to the greenery I had already chosen for the filling. I let the two cheeses soften up and then blended them by hand with about ¼ cup of chopped herbs. 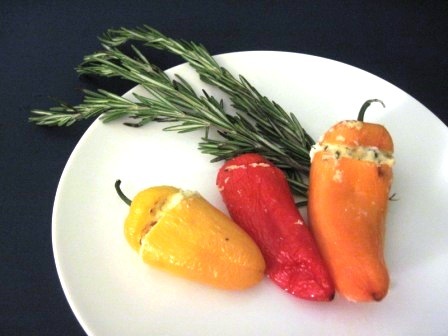 Sweet Mini Peppers are grown in Mexico and distributed by Wilson Produce. They come in three colors—red, orange, and yellow—and range in size from two to four inches. They have a bell pepper flavor, but they are sweeter and more intense. 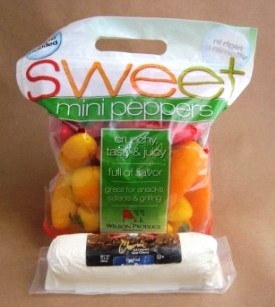 Sweet mini peppers are low calorie and highly nutritious. Three peppers contain about 40 calories with 260% of the daily allowance for Vitamin C, and 35% for Vitamin A. The recipe (at the end of this post) said to slit the top, pull the seeds out, and then stuff the peppers. Even though most of the peppers didn’t have so many seeds, the yellow ones seemed to be full of seeds that did not want to let loose. Some of the pepper caps came loose from the pepper bottoms. Once I started stuffing the peppers, I made a huge mess—so bad a mess that I couldn’t even take a picture. Up to my elbows in goat cheese, I was ready to give up from the get-go. The cheese wouldn’t go into the pepper with a spoon, so I had to use my hands. As soon as I got a finger of cheese inside, cheese came squirting back out the top around my knuckles. I really needed a piping bag. The sides of all the peppers ended up covered with goat cheese mess. I stuffed 20 peppers with the 14 oz. of cheese, and they were all hideous. Stuffed Peppers, cooked and a little wrinkly, but looking sharp! I put them in the oven at 350° for about twice as long as the recipe suggested because I wanted softer peppers. They did wrinkle up some under the heat, but amazingly—I don’t know if it was the Pam that I had sprayed in the pan or the oil seeping out of the cheese or the slick exterior of the pepper or what—but the cheese mess on the outside of the peppers either slid off or baked off. The end result was a tray of proud little stuffed peppers with bubbly, fluffy white cheese peeking out of the necks. The cheese was 70 calories per oz. with 6g of fat per oz. Not bad. Each pepper probably averaged around 60 calories with 4g of fat. They were extremely easy to eat and the peppers got semi-soft and extra sweet after they cooked. The small ones were good to eat whole like a jalapeño popper, and the larger ones, I cut with a fork and knife. They didn’t heat up so well in the microwave because the peppers got a little too chewy and the cheese got runny, but the flavor was all there. In spite of the mess, this recipe gets a vote of five peppers! Preheat oven to 350° F. Leaving the stem intact, cut a slit along the top of each pepper and remove the seeds. In a small bowl, combine goat cheese and snipped herbs. 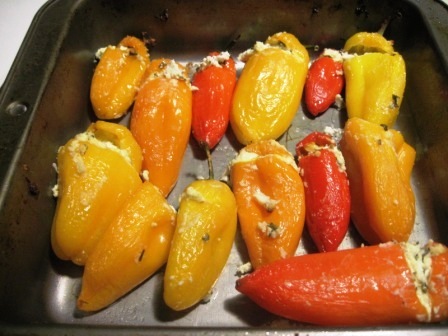 Spoon cheese mixture into prepared peppers. Arrange filled peppers close together on a baking sheet. Bake for 20 minutes or until cheese is heated through and peppers are crisp-tender. Serve warm. Garnish with fresh basil leaves. ¡Buen apetito! This entry was posted in Cooking and Cheesemaking. Bookmark the permalink.